OAuth is an open standard for authorization. Cloud Elements uses OAuth to interact with Elements in the Document Hub during the provisioning process. The diagram below shows a standard OAuth interaction with a service endpoint. An application user performs an action that requires access to a service endpoint. The application then redirects to a well-known OAuth URL for the service endpoint. The user logs in, if necessary, and grants access to the application. After access is granted, the service endpoint redirects to the URL configured in the “Set up your Application with the Endpoint” section. The redirect URL includes a code that the application exchanges for OAuth access and refresh tokens. These tokens are then used in subsequent API requests between the application and endpoint. Each endpoint has different expiration intervals for the tokens, which the application must manage. 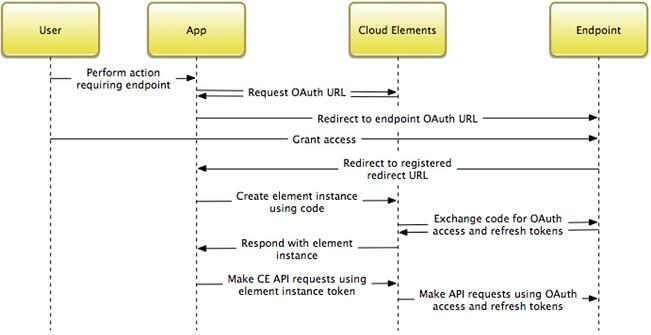 The diagram below shows how Cloud Elements uses OAuth during Element provisioning. An application user performs an action that requires access to a service endpoint. The application requests the OAuth URL for the service endpoint from Cloud Elements, then redirects. The user logs in, if necessary, and grants access to the application. After access is granted, the service endpoint redirects to the URL configured in the “Set up your Application with the Endpoint” section. The redirect URL includes a code that the application uses to create an Element instance. Cloud Elements uses this code to exchange for OAuth access and refresh tokens. Cloud Elements stores these tokens before responding to the instance creation request with the Element information, including an Element instance token. The application then uses the Element instance token to make Cloud Elements uniform API requests. 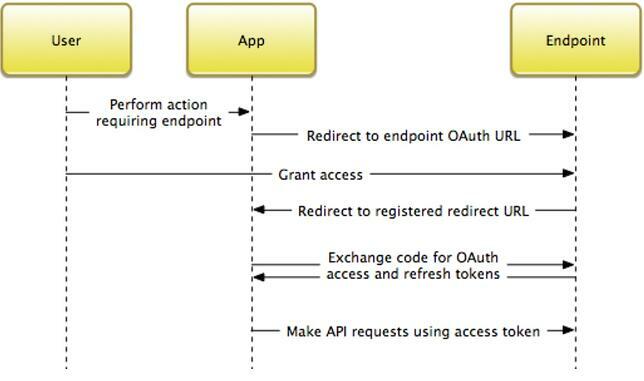 Cloud Elements makes endpoint API requests using the OAuth tokens obtained from the endpoint. Each vendor’s OAuth implementation varies slightly, but these details are handled by Cloud Elements. Cloud Elements also manages the app’s OAuth access and refresh tokens internally. The user does not need to worry about storing these tokens or refreshing them when they expire.